We all seem to have some scratches, swirls and scars on our vehicles from car washes, nature’s droppings, backpacks, luggage and just general use. Now you can restore your vehicle’s appearance to a high gloss shine by removing oxidation, swirl marks, and light scratches. Protect your paint and help make your car look like new again. This will improve the appearance and increase the value of your car. 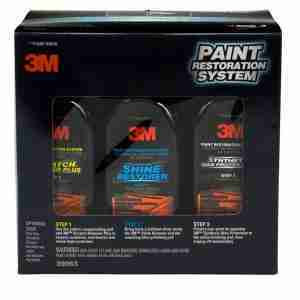 I tried the 3M Paint Restoration System on my daily drive and was impressed with the results. It looks new again and instead of trading in the everyday ride, I’m now going to keep it. It looks like new. The kit comes with scratch remover plus, shine restorer, and a synthetic wax protectant as well as a scratch eraser pad and all the necessary foam pads. The restoration kit is designed to be used with an orbital sander or polisher. The results are worth the efforts.